It rises up from its knoll to command its surroundings. A veritable fortress of pre-war brick and vintage architecture, this depression era icon is a dedication to the American Spirit. The vast, truss-framed barrel roof has provided shelter to generations of soldiers and families. The vaulted wall of arch top windows at either end forge the daily sunshine into shafts of light that dance across a prairie sized floor. Tinker, tailor, soldier, and sports heroes alike have all shared that sunshine in the once vibrant and community-centered facility. Sending young soldiers off to war, sporting events and the arts have woven the fabric of New Rochelle’s “Rich History”. This building is ready to breathe life back into the City but it needs YOUR help, NOW ! “But what can I do?”– It’s the most common question asked and yet it’s the easiest to answer. Get involved! Ø Come to our next meeting. 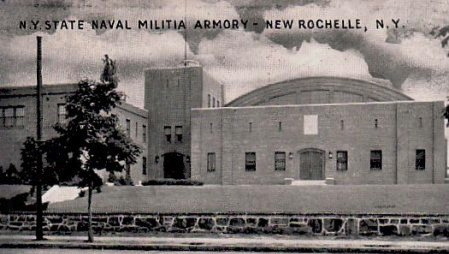 Thursday, June 7th at the American Legion Post 8, 112 North Ave. New Rochelle at 7:30 P.M.
Join the Save Our Armory Committee as we shape the future. Volunteers are needed at all levels such as fundraising, technical support and canvassing. Every great journey begins with the first step. Your first step.